I decided to go with a monochrome look and an Easel Card. Image was coloured with Inktense pencils in shades of blue, outside of image was inked with stormy sky distress ink with the die in place. Die used to cut the shaped layers was spellbinders labels, sentiment was stamped in archival ink denim and edges of card were distressed. Wonderful card! Love how you used the die! 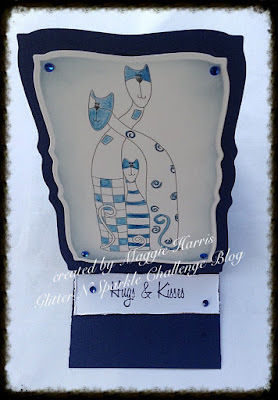 Beautiful project...Thanks for sharing with us at Crafty Gals Corner. Oh, I do like those quirky cats - what a great image - and the monochrome blue tones give it an elegant simplicity which is really appealing.